Reducing fleet emissions can be seen as a difficult task as producing greenhouse gas (GHG) emissions when running a fleet is inevitable. Reducing your fleet emissions will not only help the environment it will save your company money on gas, and who doesn’t want that? The concept of reducing your fleet emissions is quite simple: the greater your fuel consumption, the greater your emissions will be. Reducing your fuel consumption will, in turn, reduce your fleet’s emissions and save you money. The way employees drive company vehicles will either increase or decrease fuel economy and greenhouse gas (GHG) emissions. Fleets that are serious about becoming more sustainable must strive to modify their driver’s on-road behaviour to reduce fleet emissions. GoFleet wants to work with you to lower your GHG emissions and save you money. Our intelligent GPS fleet tracking system makes reducing fleet emissions easy. Communicating these tips to your drivers and having them implemented are two totally different things. Yes it is one thing to tell them to make these changes but how will you know they are in fact changing their habits? Our GPS fleet tracking system will not only help monitor but also help implement and point out the negative driving habits of your drivers. Aggressive driving like speeding, aggressive acceleration, hard braking and harsh cornering can all be monitored in our GPS fleet tracking system. It will show all of the listed infractions on the map exactly where it happened. We also have Driver Scorecard Reports where it will list the number of incidents each driver has had over the last week in comparison with all other drivers. Speeding and idling are two of the largest contributors to higher fuel consumption. We offer something called “Audible Driver Alerts” that will alert your drivers of these infractions immediately when it happens. If your drivers are speeding or idling our device will detect it and start beeping, it will continue to beep until the infraction is fixed (speeding/idling is stopped). This feature also works for monitoring seat belt use. Our software has a route planning tool that allows you to optimize your routes to save time and save on gas. Reduce fleet emissions by driving shorter distances to destinations. Since our software is so advanced it displays the posted road speed in comparison with your driver’s speed on the map. This is another way to ensure your drivers are not speeding, not wasting gas, and possibly the most important element, make sure they are obeying traffic laws. Through effective implementation, you will be more likely to not only improve your fuel economy but also decrease GHG emissions and boost on-road safety. Reducing your fleet’s emissions will not only benefit you (and save you money) but it will also benefit the environment. Transportation is one of the largest, if not the largest, source of air pollution. 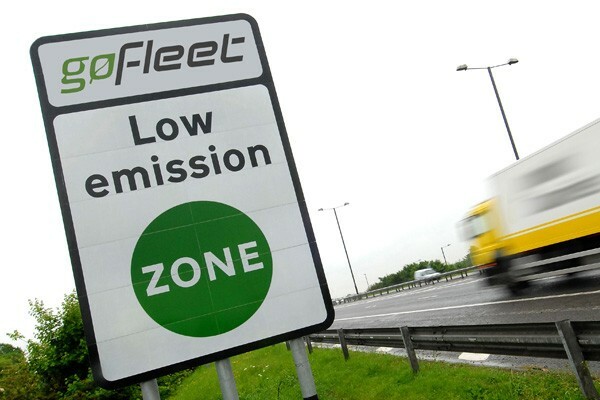 Contact GoFleet to find out how our GPS fleet tracking systems can help you move towards running a greener fleet and significantly reduce fleet emissions.